CLEAN Choice is proud to offer “Totally GREEN certified” EPA-Dfe and CRI-SOA approved professional household cleaning products and you can have them delivered right to your door. 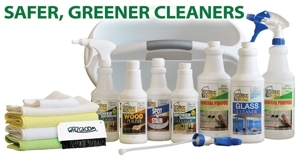 CLEAN Choice Cleaning & Rerstoration is proud to offer homeowners safe green cleaning and treatment products for all your flooring needs.Now you can order professional green household cleaning products and have them delivered right to your door. Pet Spotter, Odor Eliminator, Wood Floor Cleaner, Stone Rejuvenator, Leather Care Products, just to name a few, along with various accessories. Each product has a how-to video on the website. CLICK HERE to view videos.